The Takumi H12 CNC double-column machining center is designed for parts that require outstanding speed and accuracy, and unparalleled surface finish. The machine delivers world-class performance for die/mold, aerospace, and other high speed applications. The ladder structure and double-column design provide extreme rigidity and outstanding support to the head casting. The Takumi H12 features a 15,000 rpm Big Plus® CAT 40 inline direct-drive spindle. The one-piece base absorbs the inertia of high cutting feeds and 30 components on the machine are hand scraped for alignment during assembly. 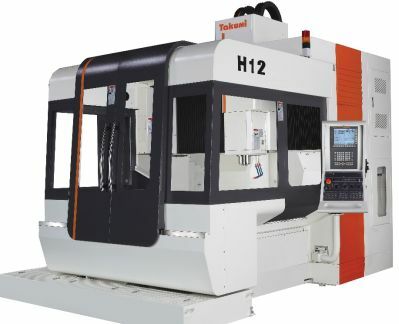 The Takumi H12 is equipped by the Fanuc® 31-i-MB series control that features AICC 2 with high speed processing, machine condition selection and Nano smoothing. The control includes 600 block look ahead and a 1GB data server with editing capabilities. Takumi USA distributor Brooks Associates will display the Takumi H12 at EASTEC.